There were a few concepts introduced in the 2nd video for Week 1 of Fundamentals of Music Theory that I wanted to expand on a little, for the sake of beginners who hear these words and don’t know what they mean. Some came from the video, and others from my own rambling about the video. As this is a bass-centric site, some of this information might be bass-specific. 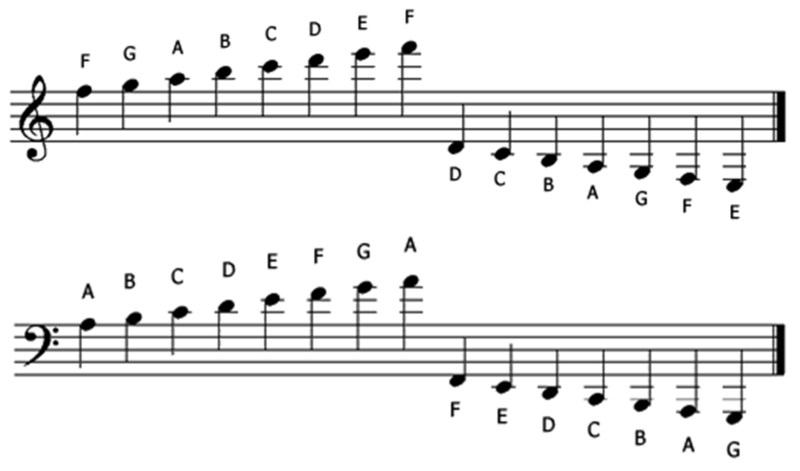 The Dummies book doesn’t mention ledger lines at all, although it says that musical staves are made up of lines and spaces when it talks about the bass and treble clefs. The Idiot’s Guide does have a definition. It says that “The lines you add above or below a staff are called ledger lines.” This is interesting to me because I thought ALL of the lines on the musical staff were called ledger lines, but apparently, its just the ones above and below the regular ones that are added in to denote tones past what can be written on the regular lines & spaces. This entry was posted on September 9, 2015 by vishalicious. It was filed under Bass Guitar, Lesson Journal, Theory and was tagged with bass, Bass Guitar, Bass Guitar for Dummies, Complete Idiot's Guide to Music Theory, Coursera, electric bass, Fundamentals of Music Theory, Ledger lines, Music, music theory. I thought the ledger lines lesson was going to make me blind. Lol. I love your graphic, though, it’s a clear view of just how they count up and down. I missed it somehow when I was doing the lesson, and kept ending up a note off in my guesses. I was really worried about the potty training too. I thought she’d drop a nice load on my desk or lap for sure, but she’s probably saving that for next time. I’ll have to come back to that image and study it, but the letters above gives a nice crutch. My eyes were bugging out during the lesson. Ahead of you only in terms of watching the videos, not necessarily in terms of comprehending all the material. I’m basically just blowing through it all, absorbing what I can and not worrying about the rest of it. You watch more attentively than I do, so it depends on how you measure progress. I’ve watched the first 3 lectures, but I’m in no way able to discuss them in anything resembling a competent manner. When it comes to understanding the lessons, you’re definitely ahead of me in that respect. 226,421 VISITORS HAVE BEEN HERE.